GOOD NEWS can accommodate 4 guests in 2 cabins. The Master cabin has a queen size bed, shower and electric toilet. A VIP Guest cabin has a queen size bed, shower and electric toilet. GOOD NEWS is fully air conditioned through out, with individual controls in each cabin. Crew has a separate companionway, heads and shower. Good News features a watermaker and an icemaker, and two 13.5 Kw generators. She features roller-furling mainsail and jib, and electric winches. 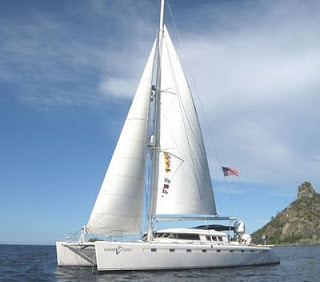 Click here for more informationon 20% off charter rates and availability.